Leo is a dramatic sign with some fundamental contrasts. Overall they’re straightforward and very predictable people. On the surface Leos are one of the most confident and aggressive signs. Fearless, charismatic and powerful. They’re some of the optimists and leaders of the Zodiac, always seeing the good over the bad, and often wanting to take charge and be noticed. They have a flair for the dramatic and often enjoy being the center of attention. Gaining the respect and admiration of others is what makes the Leo man tick, and he has the perfect toolset to do it: Dramatic, warm hearted, outgoing, passionate and impulsive. Most feel the powerful presence of a Leo man almost immediately. Although often appearing supremely confident on the outside, most Leos are inwardly sensitive and their feelings are easily hurt. In all things they need to feel appreciated and needed, especially by loved ones. To give a specific example, if you say to a Leo "you never bring me flowers!" then it will be taken as a criticism and the response is usually going to be negative. If instead you say "I really wish I had some flowers. They make me so happy!" then you’ll find your Leo is eager to provide them. Few signs are so predictable or consistent. Leos want to please you, their ego’s just rarely allow them to be told to do it. Affectionate, warm and cheerful people, Leos can be counted on to bring sunshine into other people’s lives. Dignified, playful, ambitious and loyal, they’re known for being exceptionally generous. On the negative side, they can be quite egotistical, demanding, intolerant, domineering, lazy and stubborn. They can have a very high self esteem and be dissatisfied with performing any work which they feel is beneath them. They tend to put loved ones on a pedestal and have unreasonably high expectations for them, and hence are easily disappointed. Many Leo men like to spend money on physical things which can be noticed. Flashy clothes, expensive cars, a large house etc. Generally if someone isn’t going to be jealous of it then he won’t buy it. Mean and cruel acts are generally beneath them, however they can be very aggressive, and few other signs can match their wrath when provoked. They forgive easily however, and generally don’t hold a grudge. Leo-Man and Aries-Woman - Leo man will appreciate the intelligence and sense exploration of the Aries woman. Both are extroverts and will have a full social calendar. The only problem that might arise has to do with image. The Lion wants people to respect and admire him, but Aries doesn’t care what others think. Leo-Man and Taurus-Woman - Leo man and Taurus woman are both stubborn with strong opinions. The Bull isn’t one to always allow the Lion to win arguments and debates, and she’s more of an introvert than attention-seeking Leo. If these obstacles can be worked out, however, the relationship will be powerful. Leo-Man and Gemini-Woman - Gemini woman and Leo man both love having fun and experiencing all that life has to offer, but it may still be a bumpy road for these two. The biggest problem in this relationship will likely be the fickle nature of the Twins. She’s a natural flirt and often finds it difficult to fully commit to just one man, and Leo won’t stand for this. Leo-Man and Cancer-Woman - Even though the Leo man and Cancer woman are very different, each offers what the other needs. The Crab has no desire for the spotlight and is more than willing to turn all the attention over to the Lion. She’ll also allow him to be the leader and provide a warm, cozy home for her mate. In turn, Leo will give Cancer the love, security and stability she craves. Leo-Man and Leo-Woman - Two Lions in the same jungle? The Leo man and Leo woman will both want to be ruler, so there will be a constant power struggle. If, and it’s a big if, they can learn to share the throne, the match can result in a loyal, committed relationship. Leo-Man and Virgo-Woman - Virgo woman may need to stretch a bit beyond her comfort zone to make a relationship with a Leo man work. Leo is loud and boisterous, while Virgo typically is quiet and subdued. Virgo is a perfectionist and is often critical, which the Lion simply cannot handle. She’s humble and modest and may find Leo much too full of himself. Leo-Man and Libra-Woman - Libra woman can be extremely attractive to a Leo man. Both signs love parties, people and beauty in any form. They’ll need to watch their finances since both seek the finer things in life. 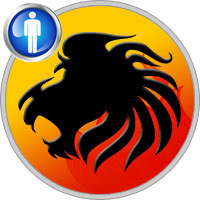 Leo-Man and Scorpio-Woman - Love can be tricky territory for a Leo man and Scorpio woman. Both the Lion and the Scorpion have dynamic personalities, and both are extremely jealous. Scorpio, like Leo, thinks a lot of herself and doesn’t enjoy praising others, which of course, Leo craves. Leo-Man and Sagittarius-Woman - Leo man and Sagittarius woman will have a lot of fun together, but a long-lasting relationship may seem beyond their grasp. Sagittarius may be too much of a flirt and a free spirit for the Lion to handle. Also, there may be a constant struggle over the limelight because they’ll both seek attention from others. Leo-Man and Capricorn-Woman - Capricorn woman has her work cut out for her if she’s determined to make a love connection with a Leo man. Leo will see the Goat as cold and unfeeling, and Capricorn will think the Lion is attention-seeking and shallow. Fights about money will likely erupt. Capricorn is a penny-pincher, while Leo has extravagant tastes and is prone to splurging on luxuries. Leo-Man and Aquarius-Woman - A pairing between an Aquarius woman and Leo man can endure with some work. Both signs have strong wills and large egos, but they’ll have a healthy respect for each other. The physical chemistry is usually powerful, but the Water Bearer is often emotionally detached and won’t lavish praise and affection on Leo to the extent he desires. Leo-Man and Pisces-Woman - The differences between the Pisces woman and Leo man can make for some excellent chemistry. The Fish is perfectly happy to let the Lion have all the attention, and because of Pisces’ passivity, she’ll never try to dominate her Leo mate. The Lion will make the Fish feel safe and loved, and she’ll reciprocate by providing a comfortable home. The only problem that might arise is Leo’s extroverted nature, Pisces would rather stay at home than be in crowds.